Any building project with FedEx in its name has to be on time. But on-time, on-budget community centers were something that the city of Memphis, Tennessee, had rarely experienced. So the construction of the new FedEx Forum in Memphis was a challenge that the architects, contractors and city officials were determined to meet. 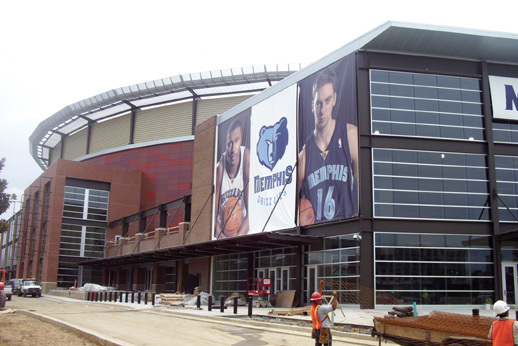 The arena, designed by leading sports architecture and engineering firm Ellerbe Becket, is the new home of the NBA’s Memphis Grizzlies. It had to be completed for the start of the Grizzlies’ 2004-05 season. Formal groundbreaking for the arena occurred in June 2002, and structural steel installation began in March 2003. Interior work, such as grease ducts and insulation, had to be completed before the grand opening of the arena in September 2004. The $250 million FedEx Forum features more than 800,000 square feet of facility space and seats 18,200 spectators on five levels for basketball games. It also hosts events ranging from concerts and hockey games to exhibitions, family shows, rodeos and indoor motor-sports. The arena offers many amenities, including a 260-seat club restaurant, an 8,600-square-foot club lounge, a 200-seat, event-level restaurant, a sports bar with exterior patio seating, and food concession areas throughout the facility. To protect these extensive food service areas from potential fire, and to meet the project’s time and cost requirements, the insulation contractor, BP Mechanical Insulation LLC of Memphis, chose a flexible, high-temperature duct wrap system for the arena’s ductwork. The use of this type of insulation was just one of a number of innovative construction and installation processes used on the FedEx Forum project to keep it moving forward. The duct wrap insulation used in the FedEx Forum project is a new, optimized single-layer flexible enclosure for one- and two-hour, fire-rated kitchen exhaust ducts and chemical fume exhaust ducts. The system has a compact design (1.5-inch thickness, 6 pounds per-cubic-foot density) and consists of a high-temperature core insulation blanket completely encapsulated in an aluminum foil fiberglass-reinforced scrim covering. The core material is made from a calcia, magnesia, silica chemistry designed to enhance biosolubility. The scrim provides additional handling strength and protection from grease and moisture absorption and tearing. The duct wrap insulation’s ease of installation allowed BP Mechanical Insulation to stay on budget and meet project deadlines even after devastating windstorms in July 2003 caused all work on the project to be halted for two weeks. 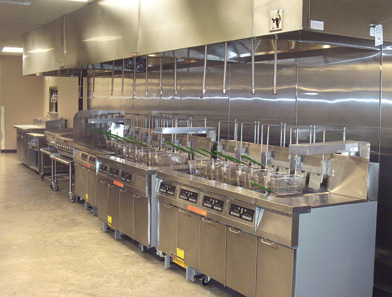 Installation of the food service equipment began in February 2004, and BP Mechanical Insulation worked hand-in-hand with Memphis insulation distributor F.S. Sperry Co. to ensure just-in-time delivery to the job site. "The food concession areas were located throughout the arena and the kitchen duct work required quick installation, often on very short notice," said Paul Fryman, sales engineer at F.S. Sperry Co. "We had the insulation available for immediate jobsite delivery in the quantity required for each specific phase of the construction." 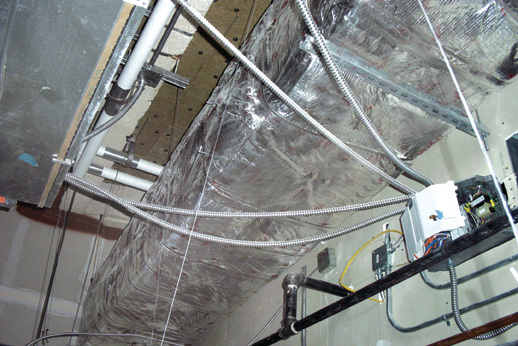 The BP Mechanical Insulation team needed to install the flexible duct wrap in all of the food service areas as quickly as possible. In many of these places there was no room to enclose the ducts with a traditional gypsum board that requires a minimum of 6-inch air clearance around the chase. The installation advantages were even more apparent in confined spaces where grease ducts were near concrete structural components, wall framing, plumbing and air ducts. Another installation advantage of the flexible duct wrap system is a new vertical installation technique that saved BP Mechanical Insulation even more handling time. For vertical duct runs, the insulation was applied in a continuous length parallel to the vertical length of the duct, instead of wrapping around the duct. 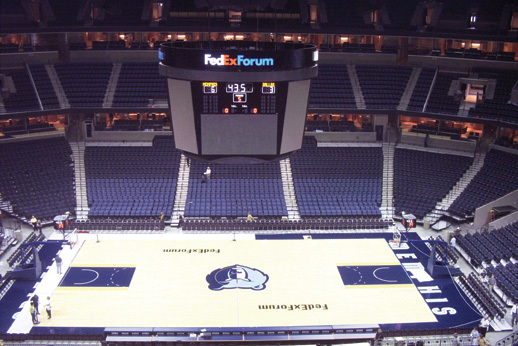 Installation of the duct insulation in all food service and other designated areas of the FedEx Forum was completed on budget and on time for the arena’s grand opening events in September 2004. Sarah Brewer is group product manager with Unifrax Corporation, Niagara Falls, New York. She has been with Unifrax for 18 years, with experience in application engineering and project management, as well as marketing responsibility for a number of passive fire-protection product lines. Brewer is active in codes and standards development and chairs a trade association committee on fire-protective duct enclosures. Construction workers outside the nearly completed FedEx Forum. The arena, home of the NBA Memphis Grizzlies, seats more than 18,000 spectators on five levels for basketball. A new, flexible duct wrap system was installed in all food service areas at FedEx Forum. A close-up of the duct wrap system.